We exist to worship of God, to proclaim the Gospel of the Lord Jesus Christ, to promote Christian fellowship, to nurture believers in the Christian faith, to engage in mission, to assist in human development and towards the improvement of human relationships, to meet human need through charitable and other services and to do such other things as many be required in obedience to the Holy Spirit. The Uniting Church’s beliefs are drawn from the Bible and from the Apostles’ and Nicene Creeds. The church also takes heed of the Reformation Witness in the Scots Confession of Faith (1560), the Heidelberg Catechism (1563), the Westminster Confession of Faith (1647), the Savoy Declaration (1658) and of the preaching of John Wesley in his Forty-four Sermons (1793). It affirms the place of ongoing theological, literary, historical and scientific study. The church’s foundational document, the Basis of Union, brings together aspects of these writings and traditions and sets out the church’s way of living and being. The Uniting Church is very democratic but is not a democracy. A democracy is a form of government in which people as a whole rule. The Uniting Church believes that Christ alone is supreme and that he may speak to the church through any of its councils. It is the task of every council to wait upon God’s Word, and to obey God’s will in the matters allocated to its oversight. The church’s representatives on any council (be it a congregation, church council, presbytery, synod or the Assembly) do not represent a majority view on an issue, they seek the will of God in prayer and by consulting together in the light of the Word of God. 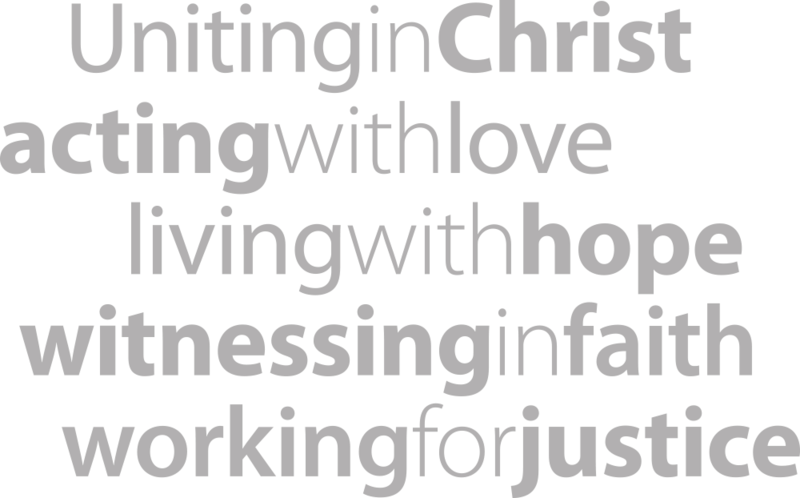 The logo (or emblem) of the Uniting Church in Australia shows the cross of Jesus Christ, in its light and love, standing over a darkened world—redeeming it through grace and truth. The Holy Spirit, is symbolised by the dove with the wings of flame, and the wide U at the bottom points to the fact that we are uniting; as a semicircle it also reminds us that the renewing of both church and world are as yet incomplete. Please read the guidelines for use of the Uniting Church emblem. The Uniting Church in Australia officially came into being on 22 June 1977, after three denominations—Congregational Union in Australia, the Methodist Church of Australasia and the Presbyterian Church of Australia—joined together. Ecumenism remains a vital aspect in all of the church’s life and work—in local congregations, national commitments to work together with other churches and relationships and partnerships with churches of various denominations in Asia and the Pacific. Here is a video made by the National Assembly to commemorate the 35th Anniversary of the Uniting Church in Australia in June 2012. The Uniting Church takes its covenanting relationship with our Indigenous members very seriously. In 1985 the Uniting Aboriginal and Islander Christian Congress (UAICC or Congress) was established by resolution of the Uniting Church Assembly. The Congress is part of the Uniting Church in Australia, but determines its own goals and objectives and decides its policies and priorities. A reflection of the power of this covenant, the 12th Assembly of the Uniting Church in Australia (2009) adopted to change the Preamble the Constitution of the Uniting Church to recognising Aboriginal and Islander people as the First Peoples of Australia. This ground-breaking change took Uniting Church members on a journey of reflection, discovery, questioning, and dialogue. In Queensland, the Calvary Presbytery represents the Congress-affiliated Uniting congregations. Across Australia the Uniting Church has a growing number of members from non-English speaking backgrounds and other cultures. In Queensland, the Synod Multi-Cross Cultural Committee is the representative body. On an Assembly level there is also a focus on Multicultural and Cross Cultural Ministry and a number of resources are available online. The Uniting Church values relationships with people of other faiths and cultures also and affirms the place of interfaith dialogue in creating and sustaining a culture of peace and harmony. To this end we have an Interfaith Relationships Committee and the National Assembly has the Relations with Other Faiths Working Group. The Uniting Church has a particular focus on ecumenism (working with other Christian churches). This is partly why we are called the Uniting Church, not the United Church. In many areas, particularly in rural or remote communities, the Uniting Church works in collaboration with other Christian denominations to provide spiritual services. In 2010 the document Living Church in Rural Queensland was endorsed by the Synod Standing Committee. Another key document is The Mission of the Church: Report of the National Dialogue between the Roman Catholic Church and the Uniting Church in Australia (2002–2008). For more information visit the Ecumenical Relationships Committee website. Three denominations came together in 1977 to form the Uniting Church in Australia. The Basis of Union is the Uniting Church’s foundational document. It states the central affirmations of the Christian faith and is a guide to what is central in the life of the Uniting Church. It also outlines the roles of the different councils of the Church including presbyteries, synods, and the Assembly. The Basis of Union is the key document on which the new church was built and sets out the way the Uniting Church operates on a day-to-day basis. The Statement to the Nation was the inaugural statement made at the time of union in June 1977. The Uniting Church in Australia’s Governing Rules are available now. This includes the Code of Ethics and Ministry Practice and the Manual for Meetings.